In order to configure WCCP redirection open administrator console on Cisco ASA and perform the following configuration steps. In order to configure the list of proxies that participate in WCCP redirection use the following commands. Please note here we assume that there is one proxy in our network. However, it is possible to have any number of proxies (not only one); the router will distribute the load among all of them providing high availability and scaling. It is possible to exclude some hosts from being redirected. The following commands show how to configure it. Here we have a host 192.168.6.100 that is excluded from WCCP. All other hosts in subnet 192.168.6.0/24 are included into WCCP redirection. List of proxies configured above, excluded and included hosts are then assigned to the access list wccp-traffic like the following. This access list bypasses proxy server and excluded hosts from WCCP redirection and forces traffic from all other hosts/subnet to be WCCP redirected. Finally we need to enable and activate WCCP redirection for HTTP and HTTPS traffic. 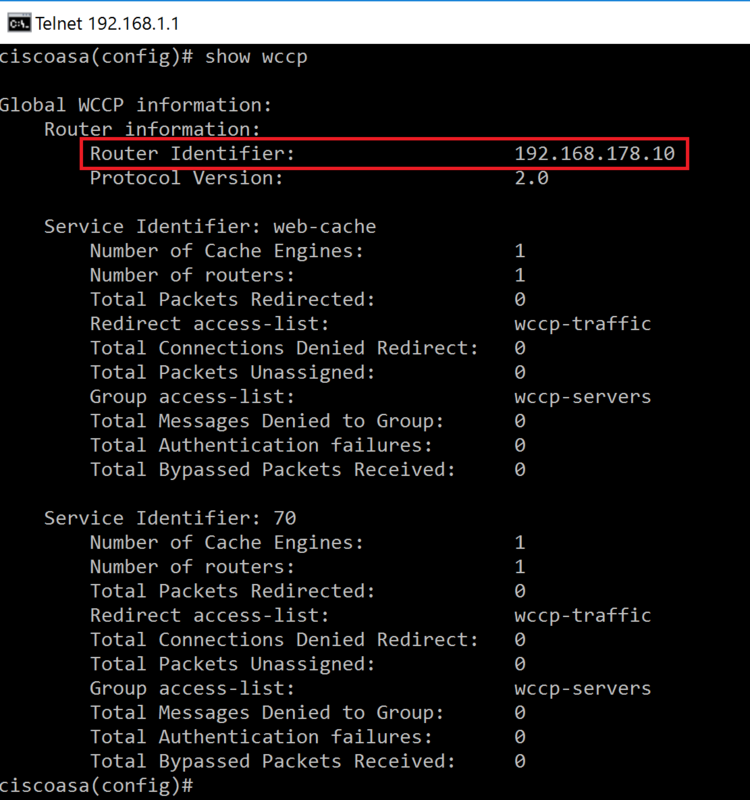 Please note how earlier defined wccp-servers and wccp-traffic access lists are referenced from configuration commands. Please note the inside in the activation command above is the name of the virtual interface on Cisco ASA (default vlan1). If you setup WCCP redirection for another virtual interface please put the correct name here! If you ever need to temporary disable the WCCP redirection run the following commands in Cisco ASA admin console. After WCCP redirection is enabled and activated in Web Safety UI, the proxy will register themselves in the Cisco ASA. Registration is usually done/refreshed each 10 seconds. The following command on Cisco ASA will show the status of WCCP registration and redirection. The output will look something like the following screenshot. Please note the Cisco Router ID shown in red on the screenshot. This Router ID will be needed on the following step when configuring the GRE redirection tunnel on proxy box.